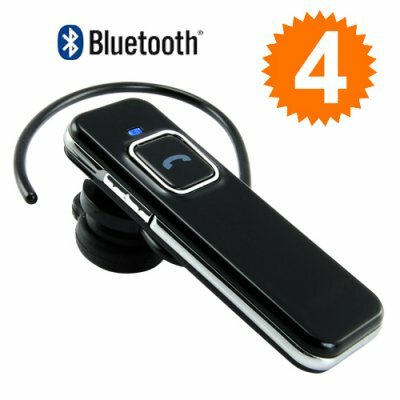 Successfully Added Bluetooth Handsfree Wireless Headset to your Shopping Cart. Lightweight and stylish, this Bluetooth device lets you make handsfree cellphone calls. It also features a detachable ear hook so you can wear it on your left or right ear. What about comfort? The ear hook is very well designed. Once you put it on, you may likely forget you're even wearing a handsfree headset! What's more, this wireless headset comes with a high quality earbud speaker and built-in MIC so you can hear you caller clearly and they can hear can you perfectly too! The CVSB-B11 is a must have accessory since Bluetooth is now standard on all modern mobile phones from high end smart phones to very basic cellphones. More importantly, this product is very easy to control since all call functions are handled using only one button. Press and hold, when you want to turn the headset on or off. Press briefly when you want to answer or end a call. That's all there is to it! This Bluetooth gadget is perfect for everyone who makes and receives a lot of calls, especially if you're in the car. Drivers will find this device perfect to ensure their passengers' and their own safety. So hit "Add to Cart" right away to make life a whole lot easier for yourself and then purchase a bunch more to resell online. Brought to you by the leader in online direct from China wholesale electronics - Chinavasion. Hours and hours of continuous talk time! The unit uses just one button for power on / off as well as answer / end calls. When you want to power the unit on or off, simply press and hold. When you just want to answer or end a call, just press briefly. I've never used Bluetooth before, how do I use this product? Operation is very easy. Press and hold the main button until the blue indicator lights blink and keep holding on until the light stays on. This should take roughly 8 seconds. Then from your cellphone, activate Bluetooth and search for active devices. Very shortly, the headset ID will be displayed on the screen of your mobile phone. Press the button indicated on your cellphone to initiate pairing. Thereafter you'll be prompted to enter a password (found in the headset user manual) and then your mobile phone and the headset will be paired.